Thinking that I would love to share my favorite park with a couple of friends who’d never really hiked before, I began cajoling them a couple months ago. I promised it would be a less strenuous hike than those they think I take on a regular basis. This will be easy I said. You will love it up there, I said. For the sake of being nice, let’s name them Surge and Tranquil Fury (TF). I have known these women for some time, although mostly from my history of employment. Surge is a bundle of energy that sparks off in words and ideas that few can match much less keep up with. Tranquil Fury is contained, even-keeled, soft-spoken and mellow as the month of May. both women are smart, articulate, kind, loving and committed to whatever they endeavor. I value them both and really wanted to share my love of Yosemite with them, even if it was for just one hike. Finally, after a lot of reassuring and planning, they agreed to what I consider, a very easy but beautiful hike featuring majestic views of the Yosemite Valley from a trail that gently winds itself from west to east around the base of Sentinel Dome. Once at the dome, we can traipse up the last .2 miles and enjoy the 360-degree view of the mountains around us. Of course, all hikes require walking and carrying of a modest load of at minimum, water, and some supplies for nourishment. But other than that, it should be a quick jaunt and then to our reward of a cheeseburger and fries. Leaving Sacramento knowing the day was predicted to be a miserably hot day, I feel even more grateful that the high elevation would offer some relief from the heat. It was going to be a good day. I knew the valley floor would be hot, but our hike was starting at about 7500 feet of elevation, it would be cooler and the weather channel predicted partly cloudy with only 10% chance of rain. It would be perfect. Perfect I say. Picking up my friends at the Park and Ride lot we talked as we drove and eventually shared a hearty breakfast in Mariposa. We sauntered over to the sandwich shop and agreed to split a foot long sandwich three ways because we really weren’t going to be hungry up there. After all, we just ate breakfast. We pile into the car and start our final approach to the park. All is well and pictures of signage are taken, we are excited and eager to get moving. I voiced aloud what my cousin says, “I’m a little nervous until we actually start walking and then it all melts away.” I proudly display my NPS pass and get permission to jump ahead of the line, and we are in! I’m not crazy like you and I’m not dangling my feet off of anything. When in Hawaii we drove to a volcano in the dark. I thought we were going to break up over that ride. Turns out, in the daylight, it was just a regular road. I have a very specific comfort zone and rarely venture outside of it. Even when my feet are firmly on the ground, if I can see a drop off within 200 feet, I feel like they are dangling off a hot air balloon, in a tornado. Even when I tell myself that I’m fine, my body reacts otherwise, and I can’t help it. I don’t like climbing step stools or reaching to a high shelf. I really, really have a problem with heights. My lack of understanding was immediately cleared up as we started the ascent on the two-lane, well-paved road to the trailhead. As I explained about how the valley was formed, my friend explains, well that’s a common misconception. She has read that Yosemite was actually formed when Godzilla and Mothra fought for their lives wreaking havoc and splitting giant rocks and creating deep valleys in the ground. Well, OK then. Unfortunately, my friend sat in the front passenger seat, you guessed it, on the side where the sheer drop-offs are in view for all to enjoy. She immediately turned her back to the door and dropped her gaze to the cup holder in front of her. Even when we assured her, me from my side of the car, and Tranquil Fury gently directed her gaze to the trees around us, she buried her face in her armpit and refused to look up. AND now I started to understand but hey I thought, anybody would wince at that drop off when you’re in a car. She will be fine once she starts walking. At the trailhead, sparks start flying. Surge grabs her shoes, poles, pack, visor etc, and is rearing to go. Oh, wait, bathroom first. The trail to Taft Point is flat, short and noneventful. Well, until you get to the last few hundred yards and you realize that you are indeed on top of a mountain and you can see across the valley. Yup, that’s when the heavy breathing started. Tranquil Fury stepped carefully and said, I can do that. I kept reminding them that the elevation was causing the sensation of not being able to breathe, but that this is not difficult. Surge looked out over and kept saying I’m not going to the edge no matter what you say. Then she would take a step further toward it. At first, refusing to look at the fissures, she eventually says, it’s incredible how a rock fell in and is wedged there like that. She looked! She never made it to the very top of the point where the rails provide you some comfort. And as I coaxed a wife to join her husband there so I could capture a picture of them both, I realized, that perhaps being afraid of a 4000-foot drop is not that silly. Later, in a moment of rest, Surge said the same thing. Ever thought that you are the crazy one? Because everyone else gets nervous around these heights, but you? Hmmm, perspective. Meanwhile, TF strikes a pose and we head out to finish the hike. All is well as we go along the ridge with the valley to our left and the Dome to our right. TF walks with Surge and helps her keep her eyes ahead while she comforts her by walking to her left as if she were a wall that would keep her from the view of the valley below. We talk, laugh, stop for the occasional picture and eventually eat lunch. Whose idea was it to get a third of a sandwich, and no chips!? We discussed the last bit of the trail and Surge asks, “There are no more drop-offs right?” I say no, we just have to make it toward the Dome and get past some switchbacks. Well, I don’t lie. But in this case, I actually forgot that there is a short portion of the trail that has a steep incline below us, starting at the actual path. Its flat, well maintained and nonconsequential according to my recollection. But that’s because heights do not bother me. As we reached the narrow trail section, Surge started to pulsate. I saw the panic rising in her and I stepped up to walk to her side, between her and the drop. I saw her move to hike on the side of the hill and I reminded her that her footing would be at greater risk on the loose soil and that the flat trail would be safer. She moved back onto the trail and kept walking. I could hear her talking to herself. I can do this. If I fall that tree will stop me. I can do this. I could hear myself talking to her. Longer strides will get you past this quicker. Stay on the trail. I’m right here. Only a little further. You can do this. TF says, you might want to relax your hands a little around those poles, your knuckles are white. I’m afraid she might offer her body for a ride down, so I encourage her to keep moving. Shoot me. I can hear my sister say, you get off that mountain right now! I am begging the NPS to send a ranger to tell me, “No, ma’am you CAN go up that Dome! It won’t take long and I can shield you from wind, rain, AND lightning.” He never came. I see hikers coming down. I see hikers going up. I know what I want to do. I know what I have to do. Surge has already started to walk away, alone, down a trail with no views. I look at TF. I concede that I won’t tell her to go up since the rain is now on us, and the thunder is louder. We head out. Our adventure is cut short. 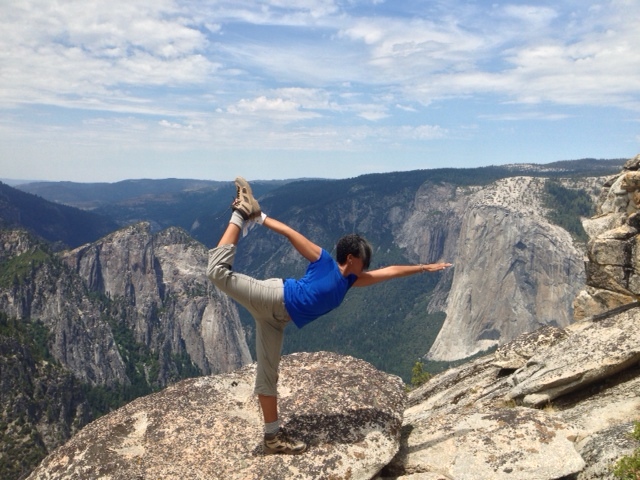 We drive to Glacier Point where Missy Surge is all of a sudden re-energized and taking pictures over the rail. A group of people begins to sing “How Great Thou Art,” and I find myself along with them. TF weeps at the beauty of it all. We realize that God places us where He wants us to be because we need to be there at that time. Surge found her own strength and courage. I am convinced that if there had been no storm that day, she would have made it completely to the top, one step, one crawl at a time. She has the energy and power within her. TF and I were just there as Surge protectors. She now knows that she is stronger than she thought and can try again later when she is ready. For that, we all deserve a cheeseburger. 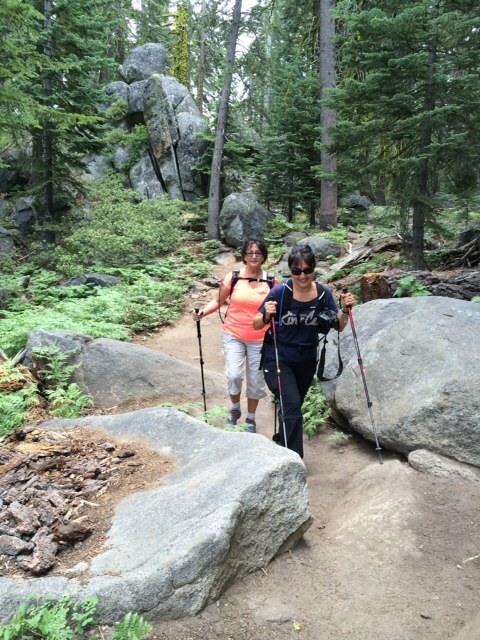 This entry was posted in All Spilled Ink, Hiking and tagged courage, Friends, Hiking, How Great Thou Art, Lightening, sentinel dome, Storm, strength, taft point, thunder, yoga, Yosemite. Bookmark the permalink.